The following is a transcript of my remarks to the House of Commons Standing Committee on Environment and Sustainable Development from Monday, January 28. 2019. Please check against delivery. Thank you for inviting me to appear before your Standing Committee to make the case in favour of carbon pricing. I am an Associate Professor at the University of Alberta where I teach and conduct research in our energy and environment programs. I’ve previously served as Visiting Scholar at Environment Canada from 2012 to 2013, and as Chair of Alberta’s Climate Leadership Panel in 2015. Since 2016, I’ve contributed to some aspects of design and implementation of the federal carbon pricing program we are here to discuss today. The fact that we find ourselves here today discussing carbon pricing is telling – despite the fact that carbon prices of one sort or another have been implemented in Canada for more than a decade, opposition and misinformation about carbon pricing policies remains rampant. There is near-unanimity amongst economists that imposing a price on carbon emissions will deliver emissions reductions at the lowest cost to the economy. Why? Because leveraging the market through carbon pricing allows individuals and firms – those who know best their costs of reducing emissions or the value they derive from emissions – to decide when to emit and pay the carbon price and when to choose other actions. To derive the maximum benefit from these policies, prices should apply to as broad a set of emissions as is feasible. In what follows, I hope to address a few common questions which come up with respect to carbon pricing. What about impacts on low income Canadians? Or rural residents? 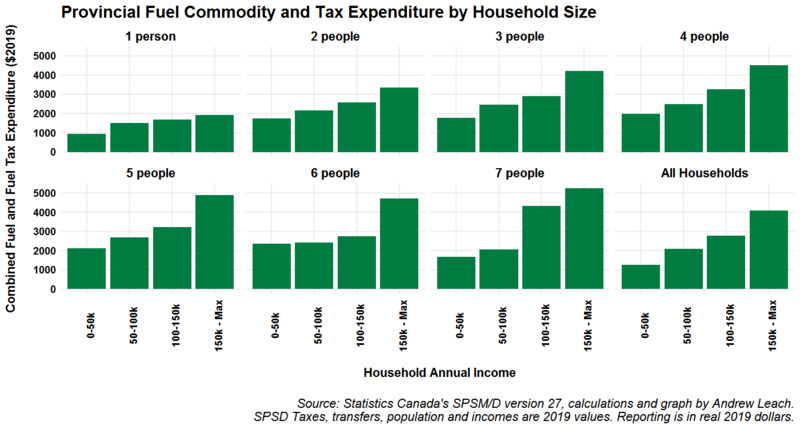 On their own, carbon taxes may be is regressive, and we often see concerns that costs imposed on lower-income households or on those in rural regions will be prohibitive. 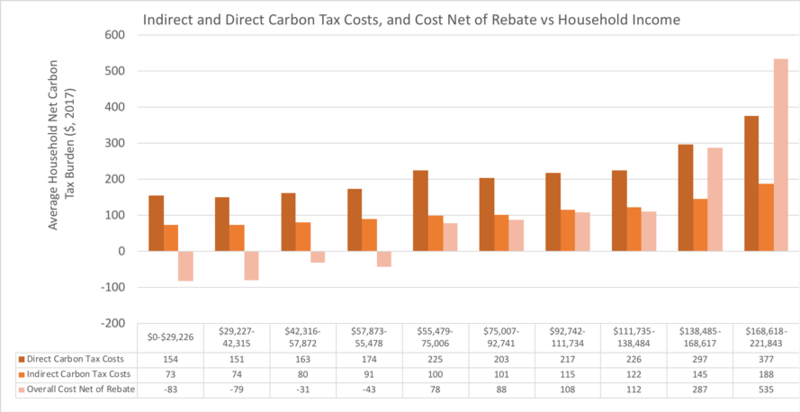 Assessing distributional impacts is important, but these concerns have been largely offset through the use of carbon tax revenues to provide lump-sum transfers or other fiscal benefits to affected groups where carbon prices have been imposed. But, of course, we must be careful not to claim that these rebates or transfers are sufficient to make everyone better off. They’re not. Importantly, these solutions also do not compromise the effectiveness of the carbon price. The price remains on emissions and that’s what will influence behaviour. I can’t help but notice, though, that some of those with concerns about regressive impacts seem to become very concerned with any redistribution of revenues deployed to address those concerns. We also hear concerns about carbon pricing applied to large industries and, in particular, about the competitiveness impacts on trade-exposed sectors. These concerns are, again, real, and particularly affect our resource-dependent provinces. Here, economics research provides a clear solution: the allocations of emissions credits on the basis of output along with a carbon price means that the impact of carbon pricing on overall profitability is mitigated, while firms retain the incentive to reduce emissions and to innovate. Not surprisingly, those with concerns about competitiveness also have concerns with these allocations, which the Leader of the Opposition has frequently characterized as exemptions for industry from the carbon price. In my own research, I’ve shown that oil sands firms, for example, would capture the same value from an emissions reducing innovation under a carbon tax with or without the allocation of emissions credits, but would not capture that value if emissions were exempt from a carbon price (see below). In the New York Times in December, US Senate Environment Committee Chair argued that, “making energy as clean as we can, as fast as we can, without raising costs to consumers will be accomplished through investment, invention and innovation.” We see similar claims in Canada that rather than pricing carbon, we should rely on innovation to tackle climate change. This is a false dichotomy. Economists like David Popp consistently find that price-based policies provide far better incentives for innovation than regulations and without the direct expense required for subsidies. A carbon price creates a market for low-carbon technologies and rewards those who can reduce emissions in their supply chains without relying on the government to pick specific winners and losers. Does this mean that carbon pricing is a panacea or that it’s the only option available to us? No. Regulations, subsidies, and other policies could have the same impacts on emissions but the evidence tells as that, insofar as we rely on those tools, we’ll reduce emissions at greater total costs to the economy. We might also suspect that some of those who are today opposed to carbon pricing might also find reasons to oppose other policies were they to be proposed and implemented. Thank you for welcoming me here today and I look forward to your questions. This week, the federal government announced more details of their Output Based Pricing System (OBPS) which targets greenhouse gas emissions from large, industrial facilities. These policies are complex (although perhaps not as complex as their acronyms make them sound) and build on a long line of similar policies proposed and/or implemented in Canada. In this post, I take you through the history of these policies, discuss which facilities are covered, and explain why the system implemented in Alberta and now being implemented as part of the federal backstop is far better than other systems in preserving competitiveness and providing rewards for innovation. Today was mostly a course prep day for me and, as part of that, I was updating a graph package for my students. 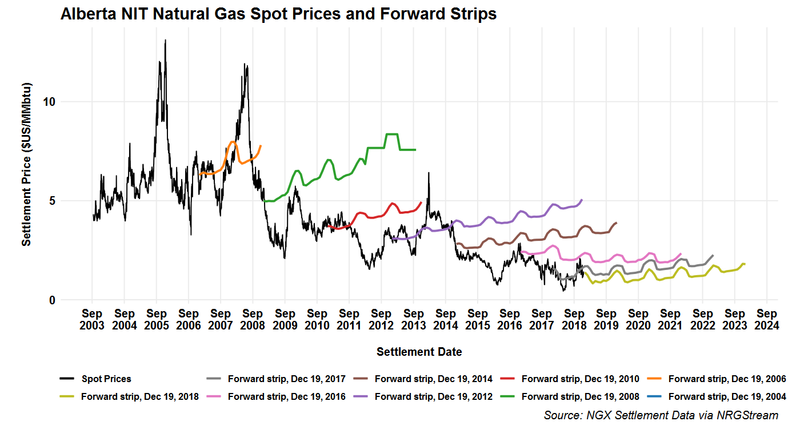 I decided to pull down some longer history on Alberta natural gas prices and overlay them with settlement prices for futures contracts. These are US-dollars-denominated contracts but for gas at the Nova Inventory Transfer (NIT, or the hub everyone still calls AECO in Alberta. The next time someone complains about high gas prices, maybe show them this? How soon we forget the times when natural gas prices were in double-digits and expected to keep going up! My fellow economist Jack Mintz has a piece out this morning in the Financial Post on Alberta Separatism. By Jack’s standards, this piece leaves a lot to be desired – it makes a claim that an Alberta exit from Canada would be easier (implied) and more beneficial (explicit) to Alberta than Brexit has been for England. Now, to be fair to Jack, given that we are mere months from an official Brexit and no one seems to have any idea how it’s going to work, it would be hard to come up with a major change in policy which would be less beneficial to the region involved than Brexit is likely to be for Britain, but let’s put that aside. The piece struck me as being glaring in its many omissions. What of currencies? Trade deals? Border security? International relations? Family connections? Perhaps amid all of these, you’ll think that the omission which struck me the most is relatively minor, but I don’t believe it is. Good afternoon ladies and gentlemen. It’s a pleasure to speak to you today to express my overall support and to provide context for the Greenhouse Gas Pollution Pricing Act, Section 5 of Bill C-74. This legislation is the backbone of the federal government’s approach to climate change and will complement the measures already taken by Canada’s provinces. It will also allow provinces without carbon pricing systems to benefit from the federal architecture to impose a carbon price and to receive the revenue collected from it. This combination – a federal policy with provincial-level flexibility – recognizes the diversity of provincial economies yet still allows for federal leadership on climate change. The Bill guarantees that carbon prices will apply on nearly all carbon emissions from energy use in Canada – from the cars on the 401 (and yes, the 417) to the largest industrial facilities. The bill provides for the federal price to be applied in provinces without sufficiently-stringent carbon pricing policy. Assuming no changes in provincial policies, implementation of this bill would likely exempt the provinces of BC, Alberta, Ontario and Quebec and likely Manitoba. 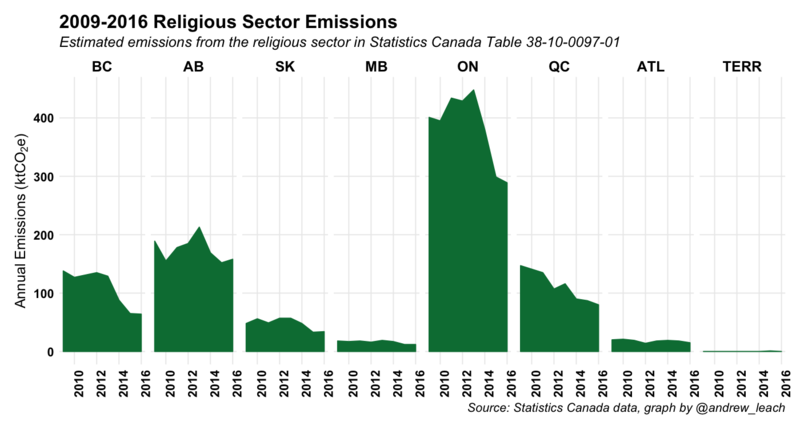 These provinces, home to 90% of Canada’s population and responsible for 83% of Canada’s emissions, would potentially be subject to this legislation were their domestic climate change policies to be significantly weakened. Why a carbon price? Simply put, a carbon price leverages the power of the market to enable emissions reductions at the lowest possible cost. It does not rely on governments to determine who should emit how much or what their technology decisions should be – it relies on individuals to make decisions. The carbon pricing plan proposed in this Bill, like current policies in BC, Alberta, Ontario and Quebec, puts a price on carbon emissions from most sources, not just large, industrial facilities. The broader the of carbon pricing, the lower will the price have to be to meet a given target or the greater will be the emissions reductions at any given price. 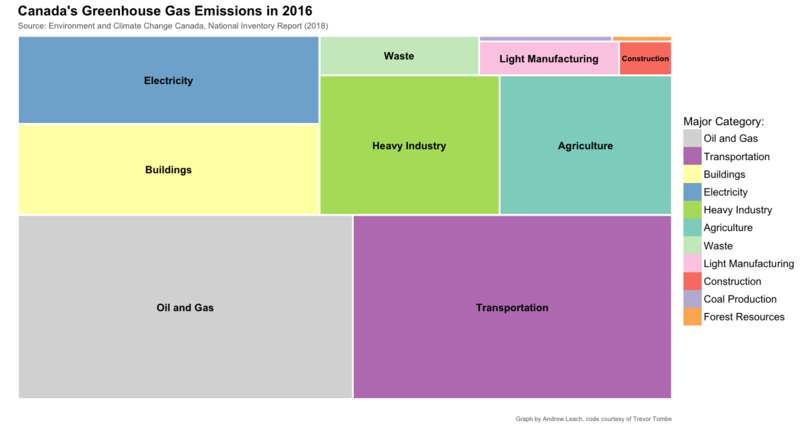 As you can see from the graphic below, emissions in Canada are not just a big industry issue. Do carbon prices work? Absolutely. We have plenty of evidence from BC’s carbon tax, which has been in place since 2008, to say that carbon prices reduce emissions below where they would otherwise be. Work by Nic Rivers at the University of Ottawa among many others has shown this conclusively. This doesn’t mean they are magic – they will not always lead emissions to be lower than historic levels, especially when macroeconomic growth is rapid or technological change is slow, but I can assure you that demand curves slope downward, despite frequent claims to the contrary. When emissions have a price, we will use fewer of them. If you think innovation and technological change are the answers to climate change, a carbon price is the best policy choice. When asked how governments could spur innovation in green tech, University of Syracuse Professor David Popp provided five rules for governments. The first of these was: Carbon price, carbon price, carbon price. Why? In Popp’s words, “supporting technology development means not only investing in new technologies but also creating demand for clean technologies throughout the economy,” which happens organically with a carbon price. A carbon price is also a useful alternative to governments picking winners with regulation and subsidies. Why not have a one-size-fits-all federal policy? 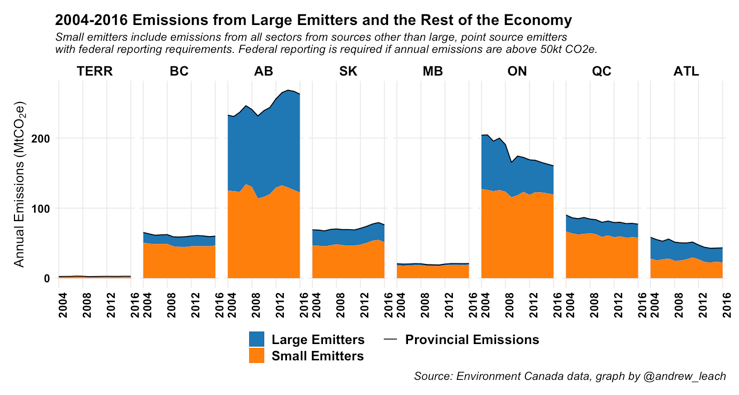 Our provincial economies have very different emissions profiles and means to reduce emissions. In some provinces, electricity is already carbon-free while, in others, long-lived, fossil-fueled assets provide electricity. In provinces such as my home province of Alberta, about 1/4 of our GDP comes from what are known as emissions-intensive and trade-exposed sectors. The national average is less than 4% and some provinces have half of that still. 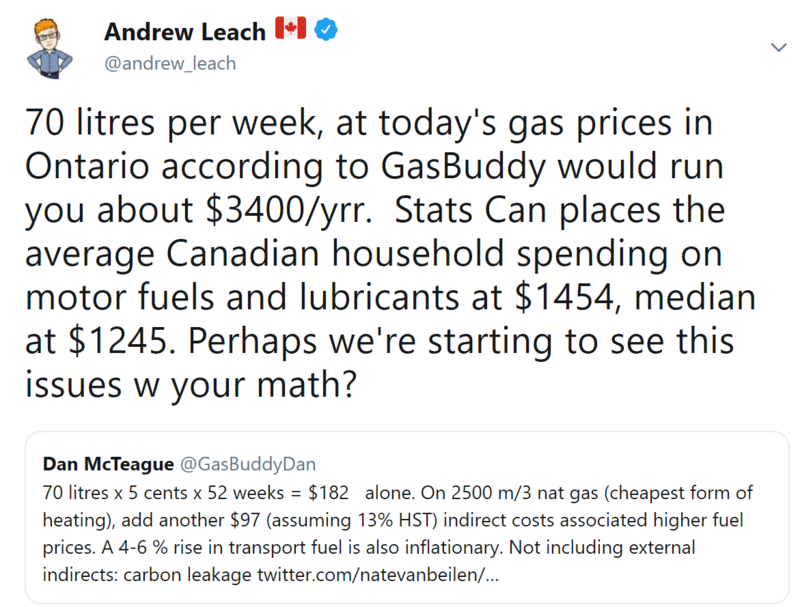 A measure which is a good fit for Ontario and Quebec might cause chaos in Alberta and Saskatchewan, while an approach such as that previously implemented in Alberta would fail to cover almost all of the emissions in many provinces in the country. The federal government has chosen wisely here, not only providing the provinces with the means to both select their own policies but also to determine the uses of the revenue from federally-imposed carbon prices. Here, provinces will certainly have different priorities. 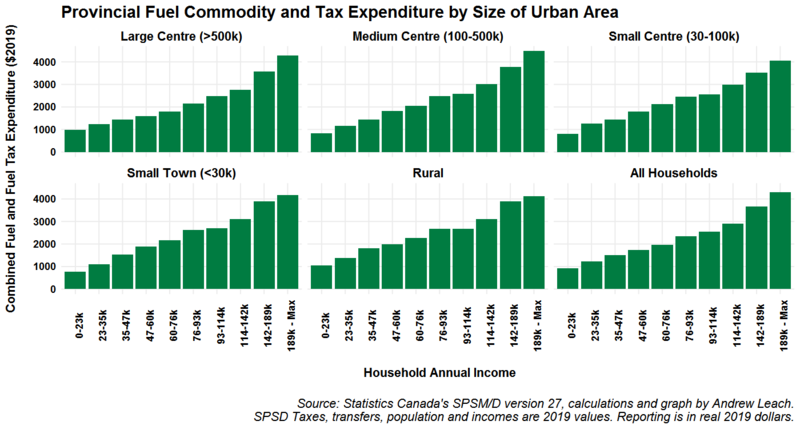 Some examples: University of Calgary’s Trevor Tombe showed that Ontario could implement a carbon tax and, without changing the distribution of income, boost its sales tax credit by 80% and eliminate health care premiums. 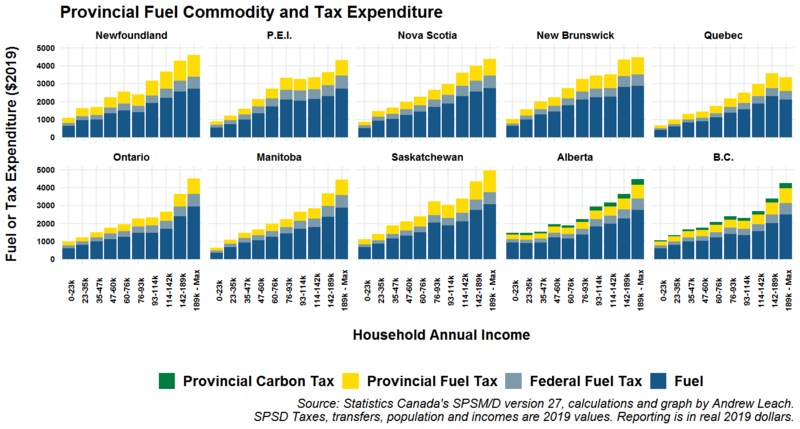 Alberta and BC have chosen policies with progressive outcomes – in both provinces, the bottom 40-50% of income-earners were better off with the carbon tax than without. These choices are far-better made provincially than federally. I do have some concerns with this legislation. I am concerned with the discretion provided to the Governor in Council to apply these measures to provinces. Section 189 (1) holds that (Cabinet) may, “take into account any factor (it) considers appropriate, including the stringency of provincial pricing mechanisms,” to determine whether a province should be covered by the federal price. Here, I’d like to see a clearer definition of stringency. Conveniently, the price on carbon allows just such a test and judging by this standard would prevent an outcome where Cabinet applies to one province a price on carbon far higher than that which it might allow to apply in others. I am also concerned that Section 188 does not stipulate that, in the event that a carbon tax is collected from a province, that total federal transfers to that province will increase…only that an amount equal to the carbon tax revenues will be spent in that province. While the government intends to address these issues through regulation, these clauses may leave an undue breadth of federal government power. Thank you for your time and attention and I look forward to your questions. Alberta’s Energy Minister Marg McCuaig-Boyd introduced Bill 12, The Preserving Canada’s Economic Prosperity Act, on Monday and stated that the province, “absolutely intends to use it if we need to,” on Tuesday. The government should never be given that chance. Bill 12 is potentially in direct violation of the limits of provincial powers which are very clearly set out in the Constitution. It certainly would be if it were used as intended: to shut off the taps to BC. For a province that relies on free, unfettered trade of resources, measures such as this set a precedent as bad or worse as those set by BC Premier John Horgan’s intention to regulate bitumen shipments in BC. Before you go any further with my post, you should read this from Nigel Bankes. Okay, now you’re back. Good. To understand why I think this Bill sets such a dangerous precedent, you have to look at what powers it conveys to the Government of Alberta and how those powers are contradictory with clearly articulated powers in the Constitution Act and/or in clear conflict with existing federal legislation. It might help to consider whether you’d like a province to have these powers if they were abused rather than used for what you consider a noble cause. (c) any other matters considered relevant by the Minister. There are two issues with this section: scope and coverage. Under Section 92A of the Constitution Act, provinces, “may make laws in relation to the export from the province to another part of Canada of the primary production from non-renewable natural resources.” Section 2(1) of Bill 12 refers to refined products which (oddly) do not fall under the primary production from natural resources, which are defined so as to include crude oil and natural gas but, “not a product resulting from refining crude oil, refining upgraded heavy crude oil, refining gases or liquids derived from coal or refining a synthetic equivalent of crude oil.” As such, it’s not at all clear that the Province has the right to enact the powers it is attempting to here over refined products, although it clearly does have the broad power to restrict exports in the case of crude oil, synthetic crude oil, and bitumen and other resources. Things get messy from there, however, as the section allows the Minister to impose a requirement for a license selectively. This provides an arbitrary level of authority to the Minister which is, at best, concerning. While the Minister’s hands in making such an order are moderately tied by subsection (3) show above, there’s a whole lot of discretion and importantly no guarantee that all similar companies be treated equally. It’s not hard to see how such a power could be abused and could run afoul of NAFTA and other relevant policies. (f) the period for which the licence is operative. The provincial government is certainly within its right to regulate the total quantities and/or daily quantities of a wide variety of resource products which may be exported from Alberta. They could, without exceeding their jurisdiction, establish licenses to this effect and make them tradeable among firms if they so chose. But, Alberta does not have the constitutional authority, at least so far as I can tell, to regulate the point and method by which exports take place, nor does it necessarily have any authority to interrupt specific exports which would otherwise be permissible with respect to aggregate export restrictions. The powers conveyed by Bill 12 are much broader than that: since these proposed licenses could be instituted such that they are only required by certain firms, the Minister could stipulate that a particular oil company was no longer able to export crude-by-rail (the method of export) to BC (the point of export), for example. Of course, that’s exactly the threat intended by the legislation: it’s supposed to enable Alberta to restrict specific exports to BC while not restricting total exports. The Constitution Act could not be more clear that this is not permissible: Section 92A (2) states that laws (in relation to the export of natural resources from the province) may not authorize or provide for discrimination in prices or in supplies exported to another part of Canada. Bill 12 clearly creates the authority for the province to do that which it it not permitted to do under the Constitution. Bill 12 also creates provincial powers in other areas of clear, federal jurisdiction. It contemplates export apportionment, in which the Minister may offer a license for, “a lesser quantity than had been proposed in the application for the licence,” and suggests that the Provincial government will begin granting export permits with regard to the available pipeline capacity. In so doing, the government will likely be over-stepping into areas of NEB responsibility where apportionment processes already determine which barrels are shipped on constrained pipelines. More importantly, the Bill will likely contravene NEB regulation and reservation of pipeline capacity. For example, NEB regulation reserves capacity for specific uses (including refined product movement) on the Transmountain system. Alberta government efforts to intervene to change the mix moved on that pipeline system would run afoul of the same areas of NEB jurisdiction as any of Premier Horgan’s would-be efforts to limit bitumen shipments in NEB-regulated pipelines. Since this debate over pipelines began in earnest last Fall, Jason Kenney and others have been calling on the federal government to invoke clause 92(10)(c) of the Constitution, which allows the federal government to exert authority over infrastructure such as pipelines which, “although wholly situate within the Province, are before or after their Execution declared by the Parliament of Canada to be for the general Advantage of Canada or for the Advantage of Two or more of the Provinces.” This clearly doesn’t apply in the case of the TransMountain pipeline, but Alberta’s Bill 12 might give the federal government a reason to use it. Section 8 of Bill 12, on orders to cease transporting, is clearly aimed at using provincial authority over pipelines within Alberta to thwart the operation of federally-regulated pipelines: it says so right in the bill. It defines a Provincial Pipeline as a natural gas, crude oil or refined products pipeline that delivers natural gas, crude oil or refined fuels into an extra-provincial pipeline. The Act then gives the Minister the authority to make an order directing an operator to cease transporting products in that pipeline. That seems doomed to fail, as more than a century of case law dating back to the early days of the railroad suggests that provincial measures that directly thwart interprovincial infrastructure may be overruled by federal jurisdiction using 92(10)(c) and this would be a prime example of when it should be (and has historically) been used. While these actions on pipelines seem doomed to fail, Bill 12 also proposes to allow the provincial government to wield this authority over railroads. This makes the pipeline parts of the bill seem gloriously conservative. I would be shocked if the railroads are not in Court to oppose this on the day the legislation is proclaimed, if that day ever comes. Alberta’s new Bill 12 represents, I would argue, the furthest any provincial legislation has gone toward limiting the unfettered interprovincial trade of oil and gas. Even Lougheed, the the depths of the National Energy Program, acted to restrict production and to ensure that Alberta retained the authority to limit total exports of natural resources so that the province would not be entirely subject to federal whim. Monday’s Bill steps far beyond that into territory that a province that relies so much on free trade of resources should be loathe to tread. Alberta’s government has been pushed here by opposition and industry clamouring for it to do something, to punish BC. We all need to take a breath before we wind up harming the very industry and undermining the very economic union that we’re purporting to defend and that we rely on for our prosperity. A lot of discussion happening about pipelines, market access and crude differentials these days. I’ve started using this map as a means of illustrating the various levels to this debate. 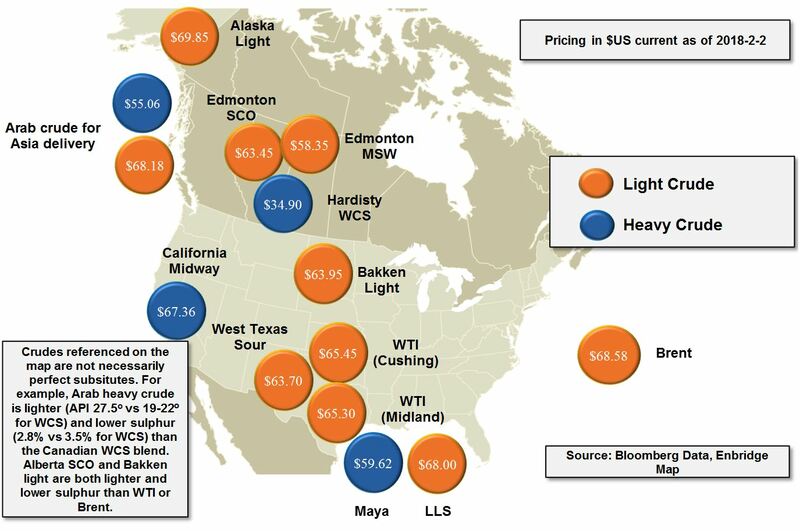 First, it’s important to always note that all oil is not equal – if you’re looking at a WTI-WCS differential and getting really upset about it, keep in mind that you’re conflating heavy crude in Alberta with light crude in Oklahoma – there are pricing differences due to location and quality involved. It’s generally more useful to look at apples-to-apples comparisons, and for that a Maya-WCS differential is very useful. Today, Maya is trading at almost $25 per barrel above WCS based (almost entirely) on geography. Pipeline tolls to the Gulf Coast are less than $10 per barrel and so, if efficient infrastructure were in place, we could expect to see at least $15 more per barrel for our product today than we are currently receiving. That hurts.